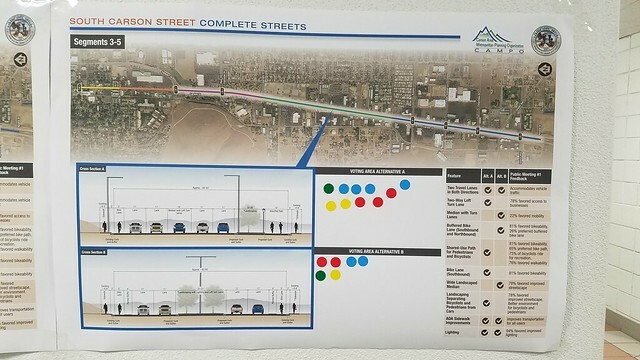 The second public planning meeting to discuss the future Complete Streets Project along the South Carson Street corridor was held on March 1st. 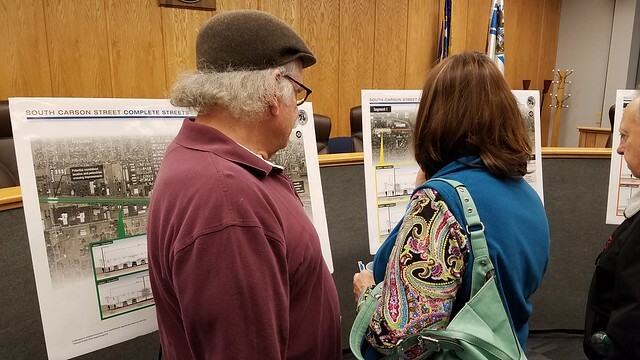 This was the follow up to a meeting held last September, where citizens voted on what features would be the most favorable in a new Complete Streets design. 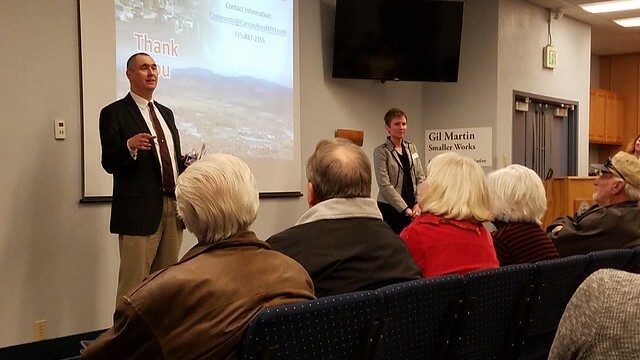 Based on the data gathered last year, this second meeting presented a couple different conceptual design alternatives followed by more public input. It was a packed house Wednesday night at the Community Center. Arriving a couple minutes late, I had to sit on the floor until another round of chairs were brought in. The audience was made up of city officials, business owners, bicycle and pedestrian advocates, and other concerned citizens. 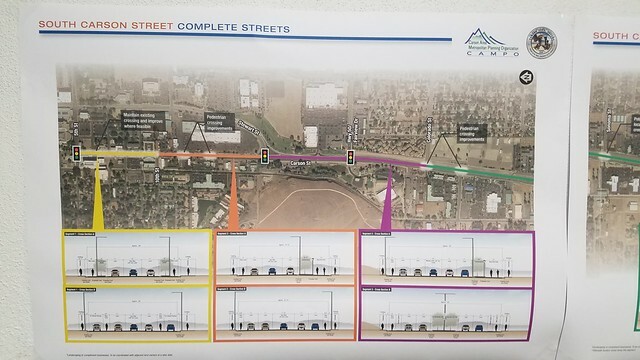 Although the first phase of construction is for the segments south of Fairview Drive, possible designs were also presented for the segment between 5th Street and Fairview Drive, the portion of Carson Street leading into the newly completed Downtown area. This was done to ensure continuity of design within the whole corridor when all phases are eventually completed. Here are a couple slides from the presentation that show the differences between the two proposals. At the end of the presentation there was a Q&A session, and then the public voted on their favorite design concept. Several city staff members were on hand to answer further questions. We were all given stickers to place on our favorite design for each set of street segments. With around 100 people attending the presentation, I was impressed with all the great questions and civility in the room. 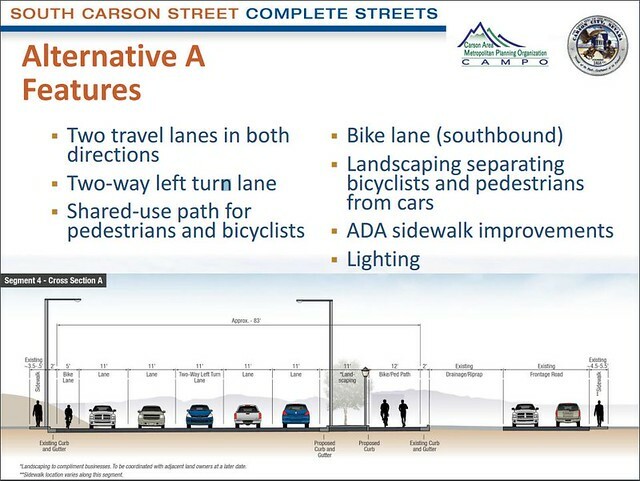 In the end, Alternative A was overwhelmingly favored over the other design that included a wide landscaped median with periodic turn lanes. 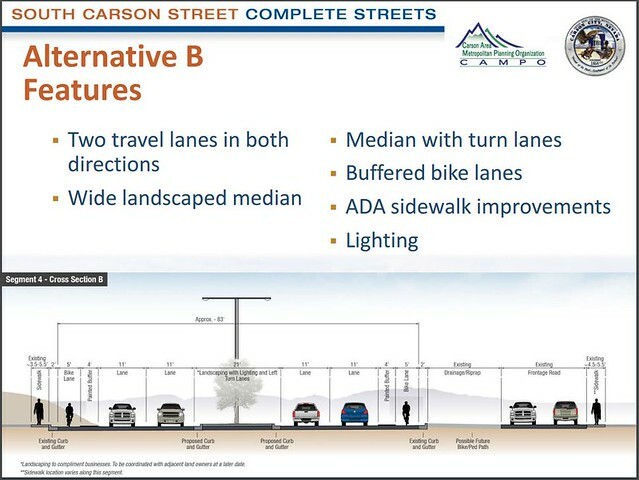 In my opinion, Alternative B appeared to have less convenient access to businesses, and the bicycle facilities were not as desirable, putting cyclists closer to the traffic. One segment of Alternative A features a 12′ wide multi-use path on the east side of the road, separated from traffic by an 11′ landscaped buffer. Southbound cyclists would still have the option of a 5′ wide bike lane on the west side of the road, but could still use the wider multi-use path on the east side. A wider, buffered path will certainly be the safer option, and also encourage usage for people of all ages and abilities. The multi-use path was also placed on the east side of the road to parallel the existing frontage road. This enhances safety by greatly reducing the number of driveways cyclists and pedestrians must cross. In addition to the possible street layouts, many other design features were discussed like additional pedestrian crossings, enhanced lighting, roundabouts, and reduced speed limits. In its current state, there are no pedestrian crossings between Fairview Drive and Koontz Lane, a mile-long stretch of wide, poorly lit road. These new design features will address a multitude of existing safety issues. It’s been great to see this project grow with the aid of the public input. Construction could begin as early as 2018, and should be able to be completed in one construction season. Although it’s a much longer stretch of road than downtown, it’s less detail intensive and will go much faster per mile of road. Wednesday’s meeting presentation can be viewed here on the City’s website. More info on the presentation and project here on the Nevada Appeal. Read more about the September meeting and Complete Streets here on Bike Carson.